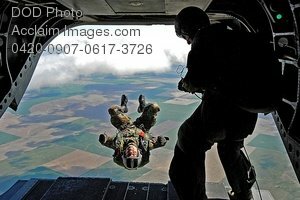 Description: Free, public domain image: Pararescue Jumper Doing a Back Flip from a Chinook Helicopter . Tech. Sgt. Derrick Brooks, a pararescue jumper with the 304th Rescue Squadron, Air Force Reserve, back flips from an Oregon Army National Guard CH-47 Chinook helicopter at 7,200 feet, during a joint operation High Altitude-Low Open jump demonstration for the Army Aviation Support Facility No. 2's Community appreciation open house, April 23, in Pendleton, Ore. The air crews with 2nd Battalion, 641st Aviation Regiment, flew the Air Force Reserve pararescue jumpers to high altitude for a parachute drop.